Gosh I love these girls, huge fan of theirs and they're all the way from Amsterdam. The thing I love most about social media is your instant friendships, in fact besties status. 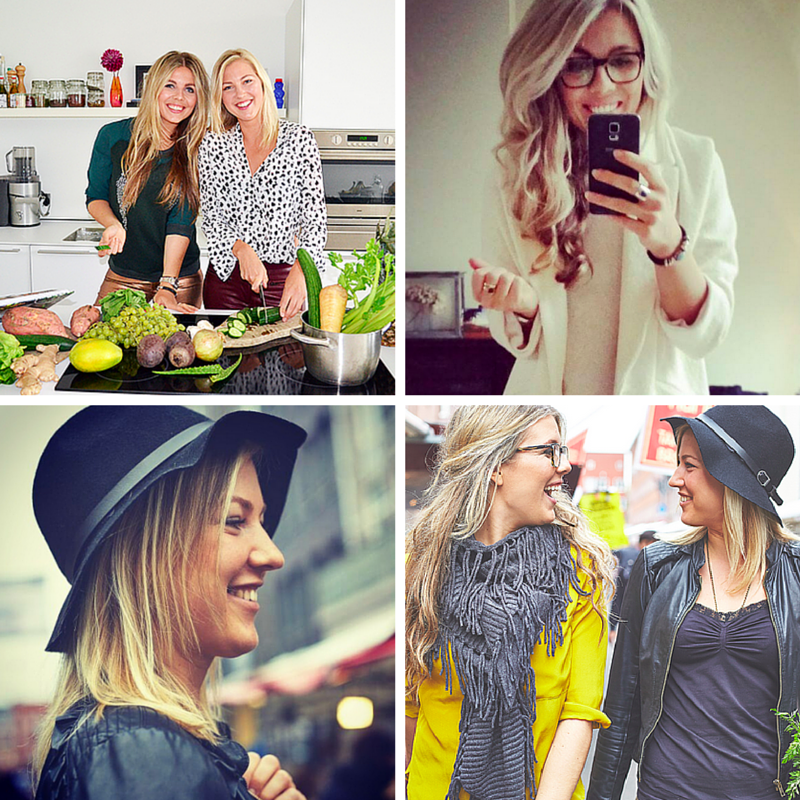 Their food and fitness passion ties in beautifully with me and I just wanted you to meet them. Please give these beautiful girls a warm welcome and lets get to know more about their Green Happiness. I do yoga, two times a week. In the winter (now in holland 2 degrees;)) I choose for more relaxing sports like walking and yoga. But I am asked to run the NIKE WOMEN’ S 10K AMSTERDAM the 16th of may, so from March I will go running 2-3 times a week to train for it. At the moment I’m doing yoga about 5 times a week, mostly Yin Yoga (the very relaxing kind) and some Hatha and Vinyasa. I love it! Besides that I bike around Amsterdam a lot of course. And this May we’re invited to do the Nike run, 10k!! So I will be training for that the next couple of months. Never ran such a distance so I’m very excited and a little nervous. Haha my dream meal is a big meal where I can eat a lot of, without feeling full or feeling guilty about that I eat too much (and also benefits my body!) So that’s why my dream meal is a big fresh salad, with grilled sweet potato, pumkin, grilled veggies and some quinoa/rice and a vinegar dressing! And maybe a banana smoothie with dates, raw cacao, and cinnamon for dessert! Sweet potatoes! Lots of them haha with a big bowl of veggies. Merel: Well I actually have a lot, it can be famous persons like Lauren Conrad, but also the neighboor who was dressed last Tuesday in a fabulous dress, or some one I dont know (and just see walking in the streets) who has a beautiful scarf, pants etc. I am actually always looking around what everybody is wearing on the streets. And on instagram i follow yara_michels, negin_mirsalehi and joshveld. Love these stylish Dutch girls! Their style is pure, classy and they always know good what to mix and match! Well i actually have a lot, it can be famous persons like Lauren Conrad, but also the neighbour who was dressed last Tuesday in a fabulous dress, or some one i dont know (and just see walking in the streets) who has a beautiful scarf, pants etc. I am actually always looking around what everybody is wearing on the streets. And on Instagram I follow yara_michels, negin_mirsalehi and joshveld. Love these stylish Dutch girls! Their style is pure, classy and they always know how to mix and match! I admire Cameron Diaz, for her relaxed and surf style. But I have to admit that I don’t really have one style icon. I have always cared about other people and made friends fast. I love people around me and get to know new people. I was a only child, so I have always looked for friends because I had no brothers and sisters in my house. I am still very spontaneous and I am very caring about other people, I want everybody around me to be happy and I want to help everybody. To bad it is not possible to make everybody happy and I hate that feeling! When I was a child, even when I was a little baby, I always looked in the mirror when I got the chance haha. I still do, although I think it’s a little less now. And I always have been very adventurous, I love to try new things, travel to new places and taking on new projects. Phone - I can't leave the phone without my phone, I find it a scary feeling not to have my phone with me because, I think I am lost without my phone. On the other hand, I sometimes leave my phone on PURPOSE home and then I feel free as a bird!! Scarf and bike - I hate cold weather so I always have my scarf with me and my bike is my true best friend here in Amsterdam! Macbook - Because I have a business on the internet, I always take my macbook with my, so I can work anywhere any time! My phone. Feels silly to say haha, but definitely since we have our own business I can’t miss my phone. Water and a piece of fruit. Just in case the day is longer than planned. My bike. In Amsterdam you’re nowhere without a bike! Now come check out their amazing and yet simple, very healthy and guilt-free chocolate brownie. You are going to love these when the 3pm slump strikes and you need a natural energy booster. Thank you so much girls for joining us today, you are welcome anytime especially with your AMAZING recipes! Check out these amazing girls on Instagram and sending you lots of love from Australia.